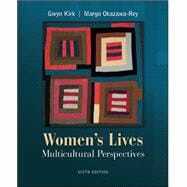 The sixth edition of Women's Lives: Multicultural Perspectivesrelies on the analyses, principles, and style of earlier editions, but with substantial changes to take account of recent scholarship. Women's Lives offers an introduction to women's studies and examines the lives of U.S. women within a global context as well as across race, class, nationality, sexuality, culture, age, and disability. 48. Pun Ngai, “Made in China” -- excerpt (2005).